One of the highlights of the year is attending the iDate Conference and Awards in Miami. Every year in January, the dating industry gets together to discuss the latest trends in dating, mobile apps, and more. When it came time for celebrity Matchmaker Carmelia Ray to announce one of five finalists in this category, I actually felt nervous and closed my eyes, hoping I’d hear my name. My wish came true, but not without the votes and support of the dating industry and all of the singles around the world who voted for me as Best Dating Coach of the Year. Here’s a quick video of my acceptance speech at the iDate Awards. Many thanks to Marc Lesnick from the Internet Dating Conference and Mark Brooks from Courtland Brooks for the great work putting together this event and for recognizing my 20+ years as a pioneer in the online dating industry. 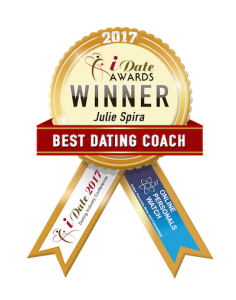 FOLLOW @JulieSpira on Twitter and Instagram for dating advice and sign up for the FREE Cyber-Dating Expert Weekly Flirt newsletter.